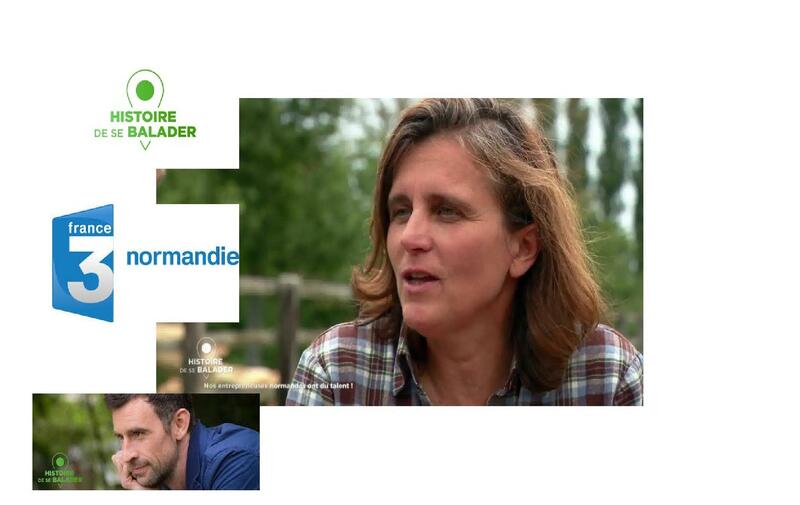 Près d’Honfleur, Agathe Letellier, militante du terroir normand, cultive 17 variétés de pommes et produit des cidres d’appellation d’origine protégée. Nouvelle génération. En trente ans, l&apos;alcool le plus populaire a perdu en folklore et gagné en précision gustative. Plus vineux que les cidres sans année, issu d&apos;une récolte d&apos;une seule année, celui-ci est conçu pour patienter volontiers deux à trois ans au lieu de quelques mois. Elaboré près d&apos;Honfleur, il offre un goût riche et boisé qui se marie parfaitement bien avec des viandes corsées. "Sur les 25 hectares de nos vergers, 17 variétés de pommes ont été replantées pour élaborer une belle déclinaison de saveurs typiques du Pays d&apos;Auge", explique cette femme de 45 ans. Dans ce paysage marqué par ses nombreux vergers, avec la mer pour toile de fond, le domaine d&apos;Apreval accueille les visiteurs curieux de découvrir tous les secrets d&apos;une cidrerie. Le Manoir d&apos;Apreval est un domaine familial qui s&apos;étend sur 25 hectares, il est situé à Honfleur en Normandie, dans le luxuriant Pays d&apos;Auge. Le domaine est aujourd&apos;hui géré par Agathe Letellier, arrière-petite-fille de Victor Révillon qui le développa au début du 20ème siècle. Le domaine est superbe, les vergers de pommiers s&apos;épanouissent dans un sol généreux, qui nourrit également un véritable édredon d&apos;herbe verte. 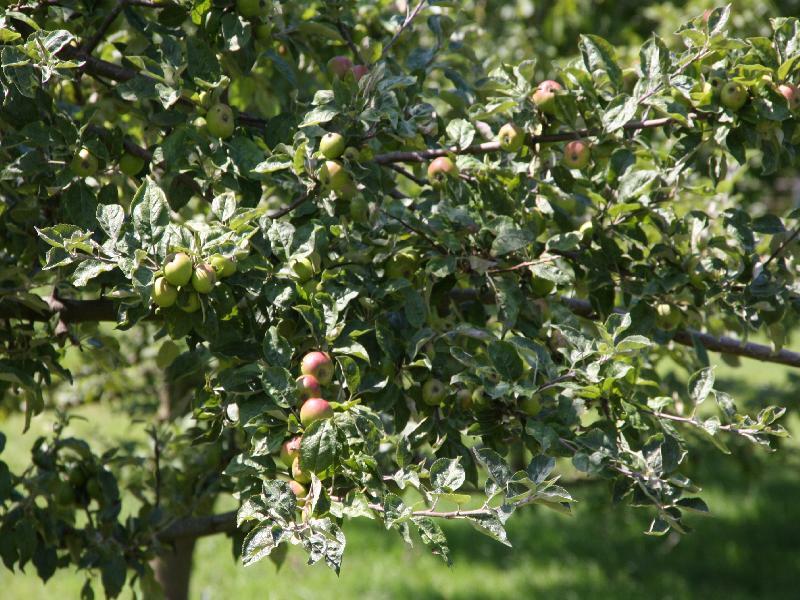 Le Manoir d&apos;Apreval cultive 17 variétés de pommes, toutes issues d&apos;une agriculture biologique. 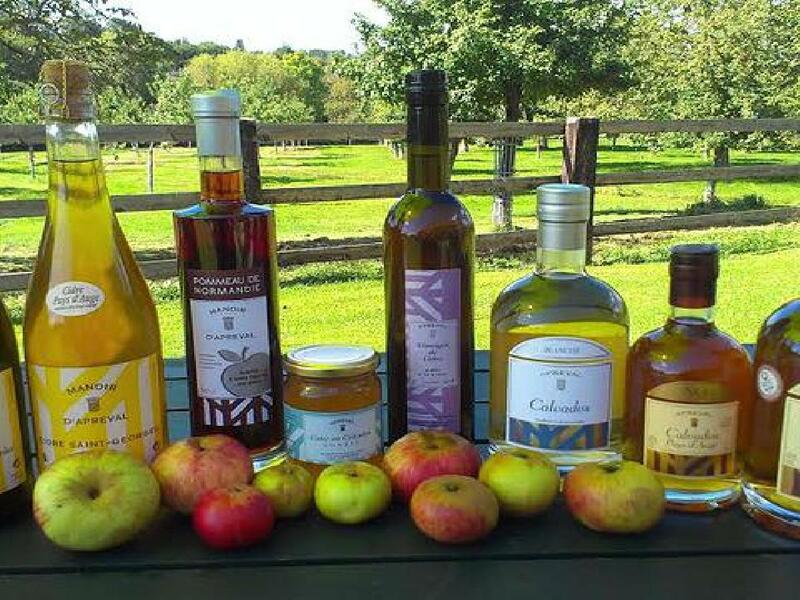 A partir de cette production, le Manoir produit des Cidres, des Calvados, du Pommeau, des vinaigres ou encore des jus de pommes. Toute la gamme est excellente et vous ne pouvez pas vous tromper quelque soit votre choix. Les amateurs de jus de fruits seront aux anges, avec un jus de pomme naturel dans la plus simple et subtile expression du terroir normand. 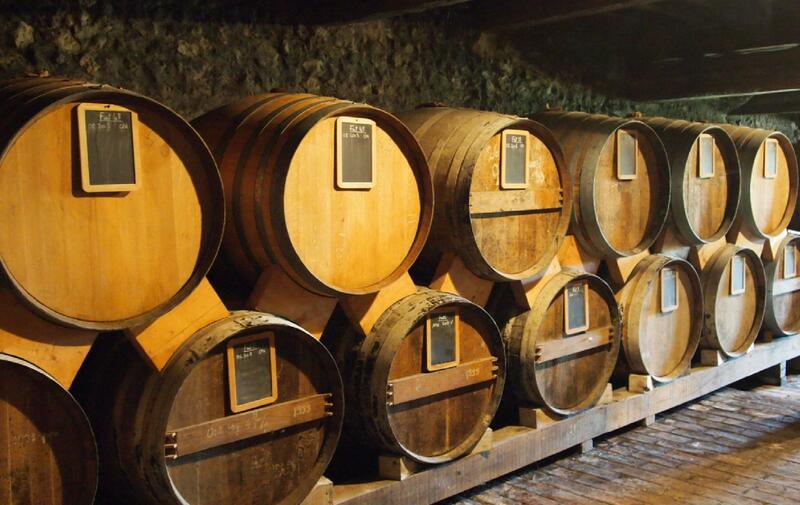 Nous sommes également repartis avec de très bonnes bouteilles de Calvados, de différentes cuvées ! Surtout, nous avons particulièrement apprécié le Pommeau du Manoir d&apos;Apreval qui est bien abouti et très bien équilibré, il s&apos;apprécie à l&apos;apéritif été comme hiver. 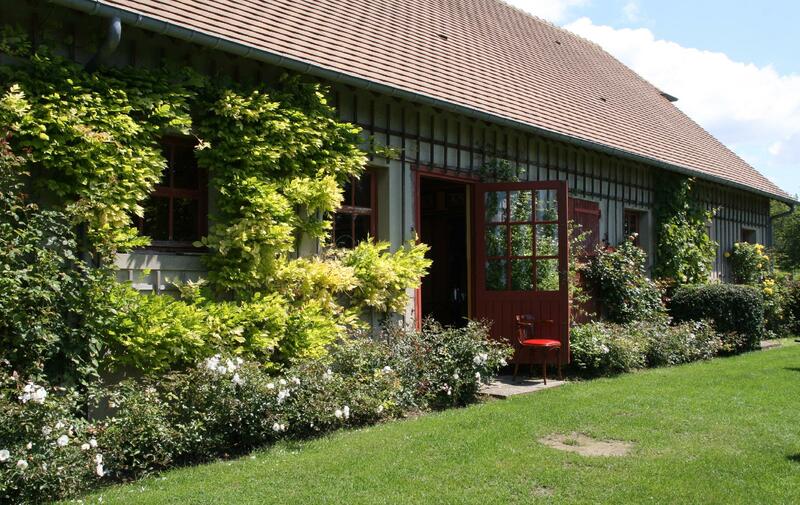 Si vous visitez la région, l&apos;arrêt pour une dégustation sur ce domaine est incontournable, d&apos;autant que vous y serez très bien accueillis. Le domaine est ouvert tous les jours de 10h à 12h30 et de 14h à 18h (19h en juillet et août). Fermeture les week-ends de mi-novembre à mi-mars et durant les vacances de Noël. De la mi-juillet à la fin août, des visites guidées sont possibles sur rendez-vous. Rendez-vous sur le site Internet qui est très bien élaboré et vous apportera notamment d&apos;excellents conseils de dégustations et accompagnements pour chaque produit de la gamme. Vieilli au moins dix ans, ce calvados se distingue par sa robe dorée son nez de noisette, de praline et de miel et par I onctuosité de sa bouche marquée par la pomme confite et les épices. En arrivant à Honfleur, j&apos;ai immédiatement retrouvé l&apos;ambiance des tableaux impressionnistes. Nose: Lots of apple with a slight cider vinegar note. Taste: Sweet, rustic and with a chewy mouthfeel. Finish: Fresh baked apple flavors with a medium amount of sugar remains quite long. At the very end, you’re fooled into thinking you’ve just eaten an apple pie slice. Overall: Quite drinkable and perfect for a light meal. Taste: Young and slightly bitter with woodiness. Finish: A bit thin and mild. The lasting impression is of a slightly fiery eau de vie. Overall: A decent young Calvados good for adding some punch to a cocktail or as the base for an autumnal beverage. Nose: Somewhat delicate and reticent, almost apple blossom-like. Taste: Bright wood notes are somewhat tempered by hints of caramel and vanilla. The apple comes through quite clearly and makes for a hearty sipper on a cold night. Finish: Dry and fairly short. There is a sense of the whole apple here, from seed to skin and flavorful fruit. Overall: Akin to applejack and yet with an unmistakable French character. Perfect for use in cocktails highlighting the juicy apple character. Nose: Bright and obvious apple. Taste: Intense and rustic with a lot of the apple character still making its presence known. Finish: Long and apple driven with spicy elements popping out now and again. But, make no mistake, this highlights the fruit and not the cask aging. Overall: Another good Calvados to use in a cocktail, or as an adjunct in an apple dessert. This would be killer used in whipped cream. Nose: Warm, mellow and with a deep baked apple scent. Taste: Very smooth and creamy with a crisp bite at the end. Fine, elegant and a fantastic sipper. Finish: Again, a smooth creaminess permeates the experience. Lovely. Overall: Very nice indeed. Excellent rendition of the art. Visual: Deep maple syrup brown. Nose: Rich, tempting notes of cinnamon baked apple. Taste: Light and crisp, with a lot of dry apple notes. Almost sherry-like in character. Quite feminine. Finish: Brief and with wisps of green apple that make several appearances. Overall: Very smooth and well-balanced. Nose: Caramel and just the slightest hint of apple fruit. Taste: Quite rich, with a lot more caramel woodiness than the 30-year-old. Almost dessert-like with an intense mid-range that is chewy. The apple plays a secondary role here, with the age of the distillation transforming it into dessert in a glass. Finish: Medium with lasting note of a strong reduction of apple and caramel. Overall: Unique and memorable. A real treat for Calvados enthusiasts. Nose: Lots of high, crisp, spicy notes. Taste: Despite the age and high-proof, this has a lot of the character of a young Calvados. The apple is quite apparent and fresh tasting. The spice comes through as pepper and there is a palpable salinity too, making for an interesting contrast to the fruit. Finish: Fairly long, but with the spice quickly fading while the apple remains. Overall: Another surprise here. I like this a lot and would pull it out once a decade as a celebratory libation. Quite a testament to the longevity and variety of apple brandies. Don’t call it apple brandy: It’s Calvados, the most exclusive of apple-based spirits and the only fruit brandy with a serious pedigree. Created by a family-owned estate of 25 hectares of apple trees (17 varieties are grown here) in France’s Pays d’Auge, on the banks of the Seine River, this French classic is making its way to the U.S. for the first time, with a staggering selection of expressions available… suitable for any price point. 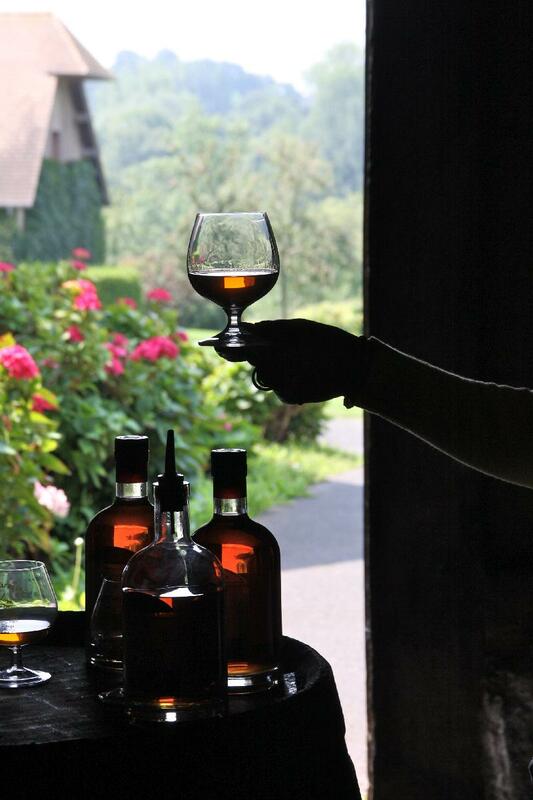 Apreval’s Calvados brandies are double-distilled, then aged in French oak barrels. We got to to try them all… nine expressions of Calvados in total, ranging from a two-year old youngster to varieties aged nearly half a century (and priced as you’d expect). So, how do they acquit themselves? Thoughts follow, ordered from youngest to oldest. 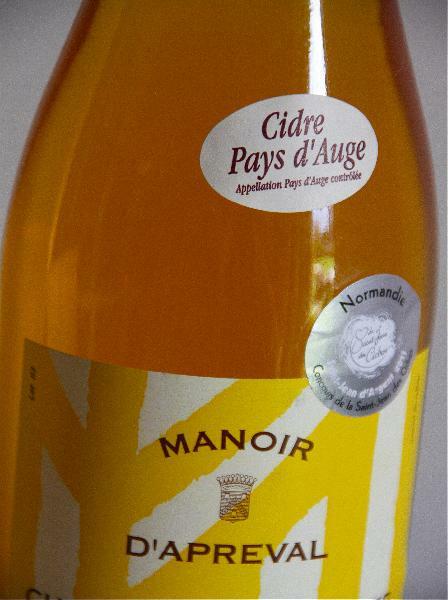 Manoir d’Apreval Calvados Blanche – Aged 2-3 years. Crisp apple aroma, but there’s plenty of heat here as well. The body offers tart apple (think Granny Smith), lemon peel, some floral elements, and a touch of wood on the back end. Rustic, almost pastoral. This is clearly young stuff, particularly on the slightly rubbery and lightly vegetal finish, but it still drinks well. I’d consider it primarily for cocktailing, sipping neat in a pinch. 80 proof. B ? 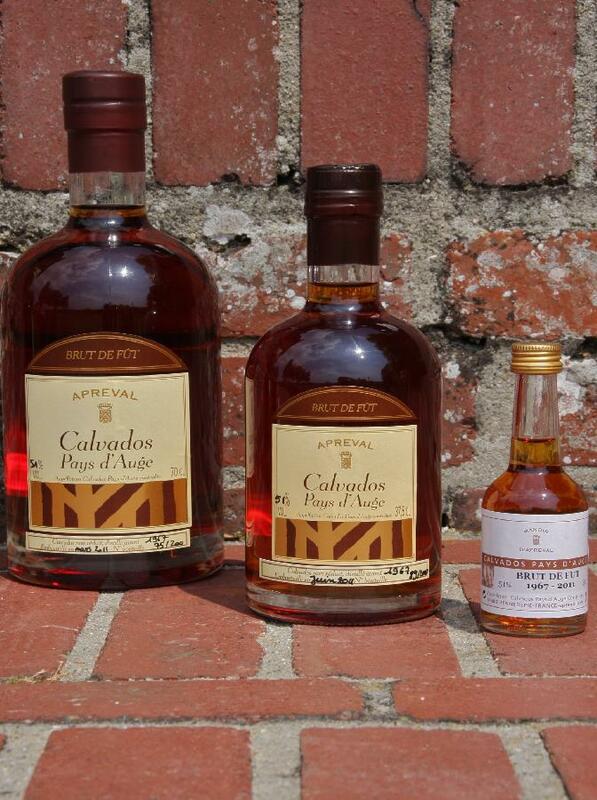 Manoir d’Apreval Calvados Reserve – Aged 4-6 years. Slightly nutty, almost Amaretto-like, on the nose, with clear apple cider coming through behind. A clearly stronger wood influence lends this Calvados a bigger and bolder body, with a rounded mouthfeel and stronger vanilla notes on the palate. The finish is still a little tough, though the more vegetal notes have started to balance out with the sweet ones. 84 proof. B+ ? Manoir d’Apreval Calvados Grande Reserve – Aged 10-12 years. The nose is mellowing out here, with more of an applesauce and gentle honey character to it. The body offers strong apple flavors, balanced by hazelnuts, chocolate, and a light herbal quality. Good balance, with a bit heat on the back end. It’s definitely a Calvados I’d have no trouble sipping on, offering the best of both the orchard and the world of brandy. 84 proof. A- ? 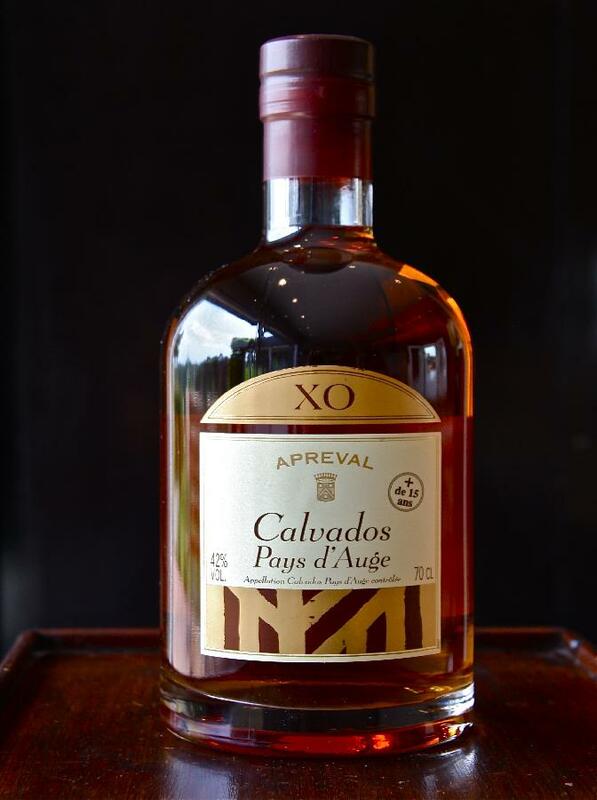 Manoir d’Apreval Calvados XO – Aged 15-20 years, noticeably darker in color (from here on out). Becoming increasingly Cognac-like on the nose, with sweet caramel, gingerbread, and incense notes… but still those unmistakable apples shining through beautifully. Robust on the body, with thick cinnamon-apple notes and a big Christmas cake character that lasts for a long while. The finish builds dramatically to something that is both sweet with notes of cake frosting, and savory, with a woody, almost earthy conclusion. Lots going on here, and probably my favorite expression in this lineup. 84 proof. A- ? 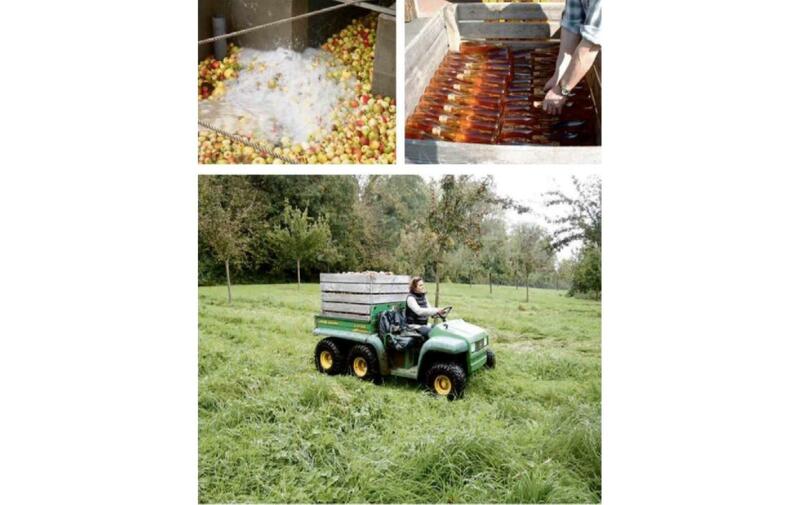 Manoir d’Apreval Calvados 1980 – Single-vintage (harvest?) brandy from 1980, 33 years old. Just imagine, when these apples were picked, Jimmy Carter was President. Sultry nose, with a slight licorice note to it, along with ample wood. The body is vast, with the wood notes taking center stage.There’s even a touch of astringency here, as the deep oak character muscles aside the fruity apple cider core from time to time. Intriguing but a much different animal than the XO. Try the two side by side for a real mindbender. 84 proof. A- ? 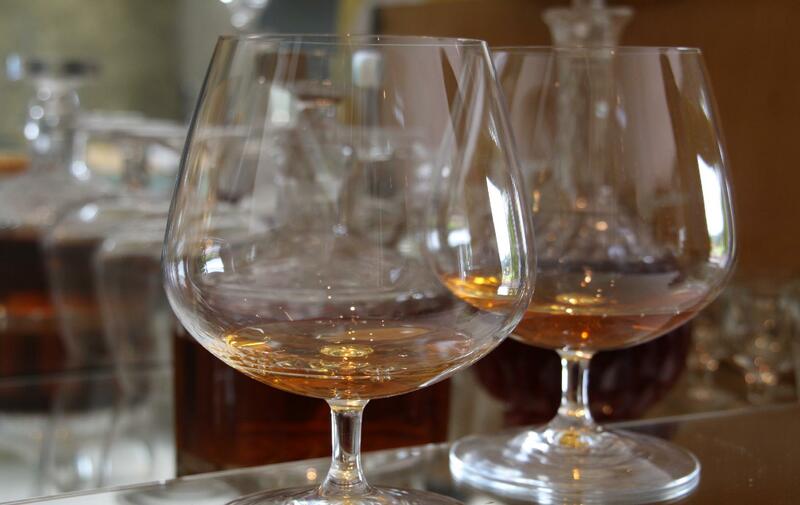 Manoir d’Apreval Calvados Cuvee Victor – A blend of brandies, each at least 30 years old. Coffee and licorice notes on the nose lend this a Spanish brandy feel. There’s lots of dried fruit — not just apples but raisins, too — on the palate, but the finish takes things toward a winey character, almost like a Marsala, with some balsamic touches. Quite the curiosity — rich and austere. 82 proof. A- ? 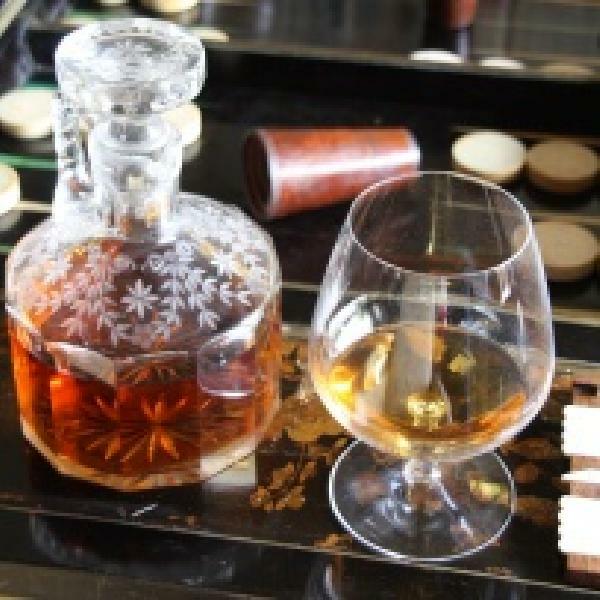 Manoir d’Apreval Calvados Cuvee Gustave - A blend of brandies, each at least 40 years old. Dense coffee, mixed nuts, and dark chocolate notes. You won’t catch much more than a bare whiff of apple character on the nose, but it comes across on the body — dried, baked, then chocolate-covered and baked into an almond torte. Another intriguing, hoary, and unexpected spirit. 82 proof. A- ? 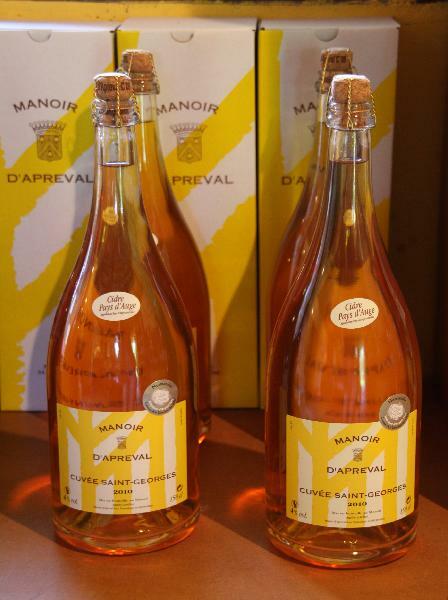 Manoir d’Apreval Calvados Brut de Fut 1974 – Single-vintage Calvados from 1974, 39 years old. Stronger apple character here than in some of the other old expressions, with a distinct vegetal note on the nose. Spicy on the palate, with some cinnamon notes, but also a tougher, more rubbery finish. Not as successful as the blends. This is no longer in production. 84 proof. B ? Im herzen der Côte de Grâce wird einer der besten Calvados gebrannt. Dort traff man auch schon seinerzeit berühmte Zeitgenossen wie Claude Monet an. 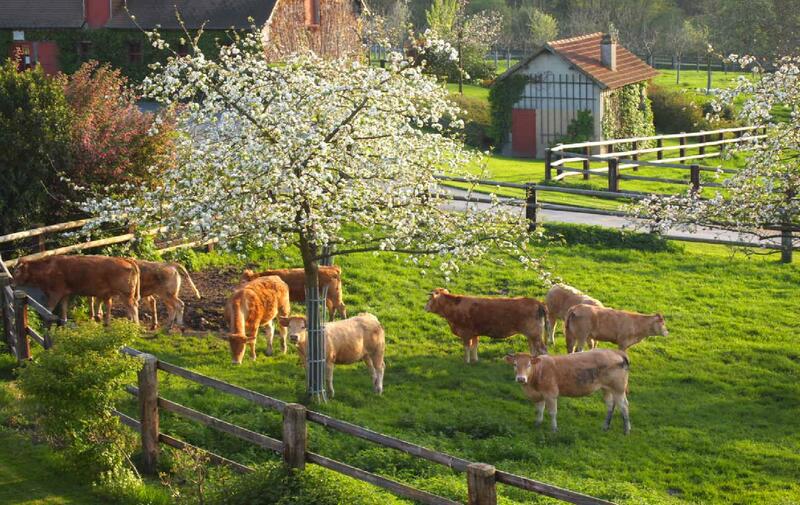 Normandy&apos;s sweeping beaches, speckled cows, and soft cheeses create a snapeshot of idyllic french life and the Calvados and haute cuisine of the region are not to be missed.